According to the American Massage Therapy Association (AMTA), massage is a treatment for total mind and body health. It the most widely used type of complementary and alternative medicine in hospitals today for the treatment of pain, mental health, stress reduction, and general wellbeing. As more and more studies and research are carried out about massage, the results point towards the health benefits of massage to be many. 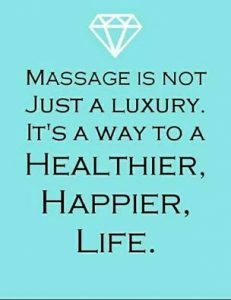 Massage has been shown to reduce tension and stress and to improve mood, reduce pain and inflammation, help with detoxifying the body and aid with mobility, postural alignment and speeding up the healing process. It is used for and helps with more than 30 different medical conditions, with more than 10 of these being pain conditions, such as arthritis, fibromyalgia, carpal tunnel syndrome, HIV and cancer. It improves and promotes heart health, reduces high blood pressure and even aids Parkinson’s disease patients with symptoms. In short, massage can be a wonderful accompaniment to more conventional healthcare routines and prescriptions, although it is not always replacement. 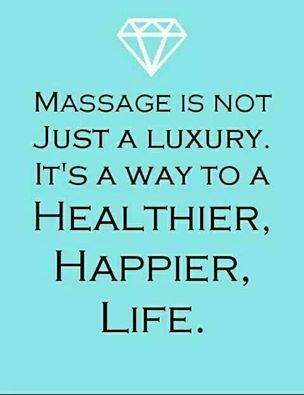 Massage is not a cure, as in order for the positive health benefits to continue, the recipient must continue to have regular sessions. However, when you do make it a priority, the benefits are not to be underestimated. A massage takes place under blankets in a warm room. You will undress as far as you are comfortable but do not worry, your body will not be exposed at any point, except for an arm, a leg, or your back. Usually you will be lying down on a massage table but again certain with particular styles of massage you may be lying on a futon on the floor: shiatsu and Thai massage are examples. The deep pressure and long, rhythmical strokes of the massage practitioner along the muscles of your body cause you as the recipient to experience a sense of comfort and safety. This in turn signals the body to relax. It is OK to turn off the stress response that keeps us on high alert, and enter into a deeply relaxed state. The pressure varies based on the style of massage, for example the Swedish method uses lighter pressure than Deep Tissue massage. Of course, the person getting the massage should be actively involved in the process and should voice their desires as far as the pressure. Massage causes a decrease in cortisol levels, which allows relaxation to occur. It stimulates the circulation of the blood and the lymph. Improved blood circulation can augment cardiovascular health, and improved lymphatic drainage will aid in detoxifying the body. Often the therapist will use oil to help his or her hands glide smoothly over the skin. Oil will also nourish and penetrate the skin, moisturizing and making it more supple. Aromatherapy massage uses essential oils from plants, which have medicinal properties. Not only do they smell wonderful as they are applied to your body but they help you heal as well. Some common oils are lavender, which is relaxing and calming, neroli, which uplifts and elevates the mood, and eucalyptus, known as good medicine for colds and coughs, mental clarity and boosting energy levels. Another benefit of massage is that afterwards you may feel very restful and sleepy. This ability to rest is what allows the body to heal. Take as much time for yourself after your massage as you can in order to rest, as this is when a lot of the deep healing work will occur. It follows from this that massage will also help you to sleep better and studies certainly support this. Numerous studies suggest that massage is beneficial for fibromyalgia, depression, anxiety, asthma, tension headaches, and pain. For cancer and HIV patients massage is helpful in encouraging relaxation, boosting mood and pain reduction. With all these remarkable benefits, it is no small wonder that more and more people are turning to massage as an adjunct to more conventional medical practices. If good health is a priority for you, then you would do well to make a regular massage an integral part of your lifestyle, rather than a pampering treat you indulge yourself in once in a while. Find a well-qualified practitioner who knows the limits of treatment: massage should not be done near a blood clot, a tumour or open wound, or over any sensitive areas, particularly after radiation therapy. Get well, get healthy…go get a massage! ← WHAT DO I DO?